Sesame oil offers many health benefits due to its high levels of good mono- and polyunsaturated fats. The oil also has many skin benefits when applied topically as well. Whether you use sesame oil during massages or take time every day to apply it to the skin, you'll be left with luminous skin that has fewer toxins and a reduction in the signs of aging. Sesame oil is chocked full of ingredients that greatly benefit the appearance and texture of your skin. The fatty acids contained in the oil, such as oleic, palmitic, stearic and linoleic acid, are effective moisturizers that keep skin supple and soft. It is also very high in vitamins A and E, which are effective at reducing fine lines and wrinkles and are added to many commercially produced anti-aging creams. Additionally, sesame oil contains antioxidants and sesamol, which counteract free radicals -- a primary cause of aging. Sesame oil is thicker than other types of oil, which in scientific terms means that it has a higher viscosity. This property allows it to seep down into your pores when you massage it over the skin and is beneficial in two main ways: First, the oil's nutrients start to work from the inside out as well as on the surface of the skin. Secondly, sesame oil can improve your circulation, according to the Times of India. Massaging sesame oil over the skin daily removes toxins from the surface of the skin, such as pollution, environmental and digestive substances. Massaging the skin in this manner is common in Indian medicine, which claims that it improves skin’s texture and elasticity. Because the oil is high in antioxidants, it can also speed wound healing when applied directly to cuts and scrapes. These antibacterial properties have also proven effective for some who suffer from skin ailments, such as eczema or psoriasis. Sesame seed oil has inflammatory, antibacterial and anti-fungal properties which are helpful in clearing up existing pimples and preventing the development of blackheads. To use as a blemish fighter, apply sesame oil to problem areas at night before going to bed and wash it off the next morning. You can also wash your face with it, similar to using a cleansing cream. 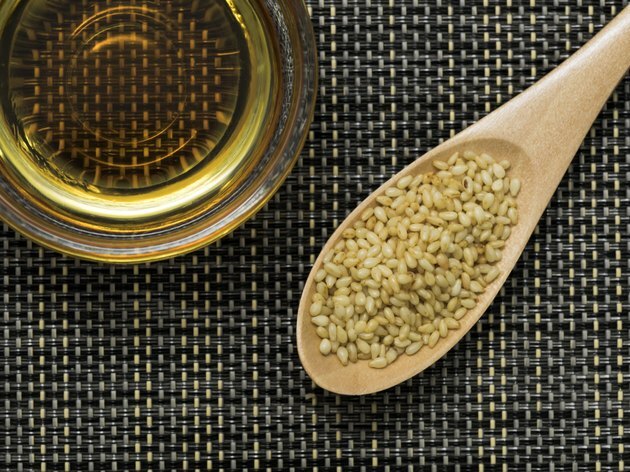 What Are the Health Benefits of Sesame Oil?